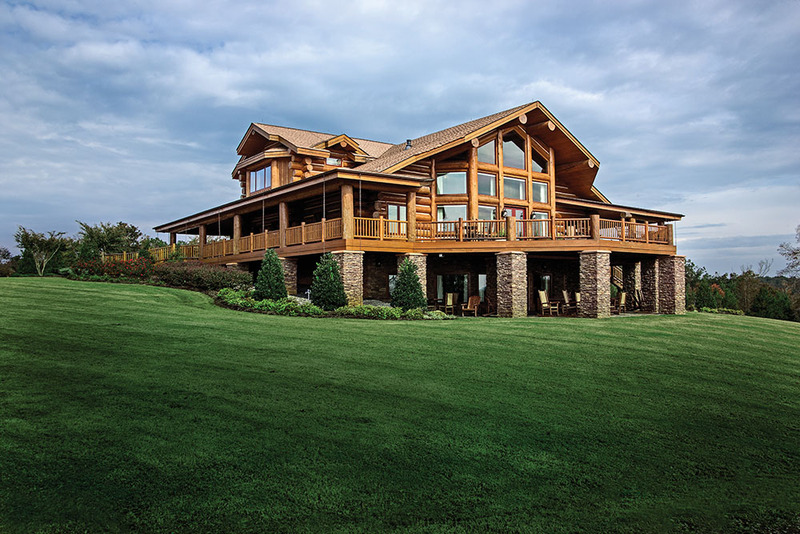 The amount of maintenance your log home will need depends on several factors, such as your home’s location, design, and finish. 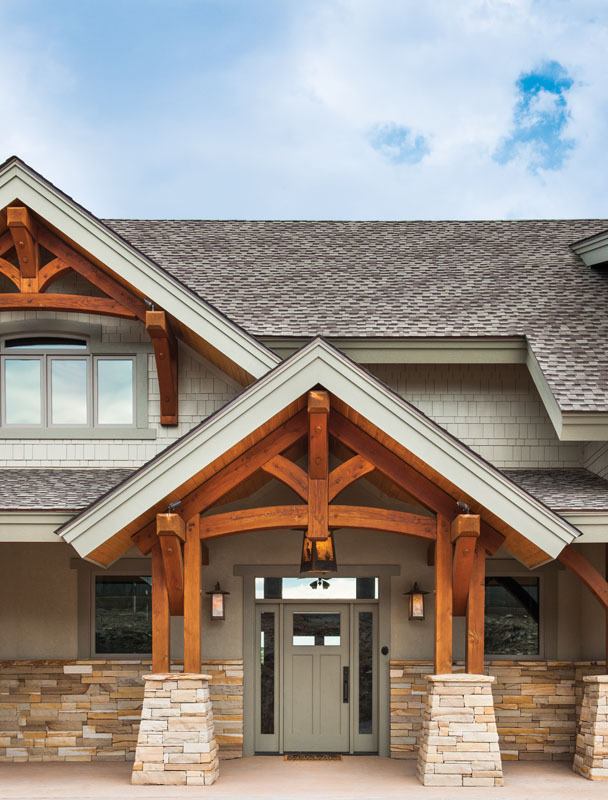 PrecisionCraft’s in-house firm, M.T.N Design was asked to answer a few questions regarding exterior log home maintenance by Log Cabin Homes Magazine. The interview, below, will answer many of your wood home maintenance questions. Log Cabin Homes: What are your top things to focus on when designing a log home to ensure that it will be easy to maintain on the exterior? M.T.N Design: The three biggest factors to keep in mind while designing a home are: 1) the specific site conditions such as location, how much snow/rain the site receives a year, exposure to sun and wind, etc. ; 2) what materials are best utilized given the conditions; and 3) how the rooflines and overhangs can be utilized to best protect the exterior materials of the home. What role does the log species play in exterior log home maintenance? Truthfully, not a lot. Some species have naturally occurring elements within them that give a slight advantage at resisting bug infestation and the elements. But, no matter the wood species, the biggest thing you can do to best insure the longevity of any wood used in your home, regardless of species, is to properly treat and maintain the wood. Considering this, what types of logs would you recommend? In regards to maintenance, no specific species. In regards to overall satisfaction, always get the best quality log or timber you can buy. It will tend to check, twist, and move less over time, and given that it’s really a small percentage more in the total turnkey cost of a home to invest in a higher quality log and timber, it makes sense. What about the chinking that you select? 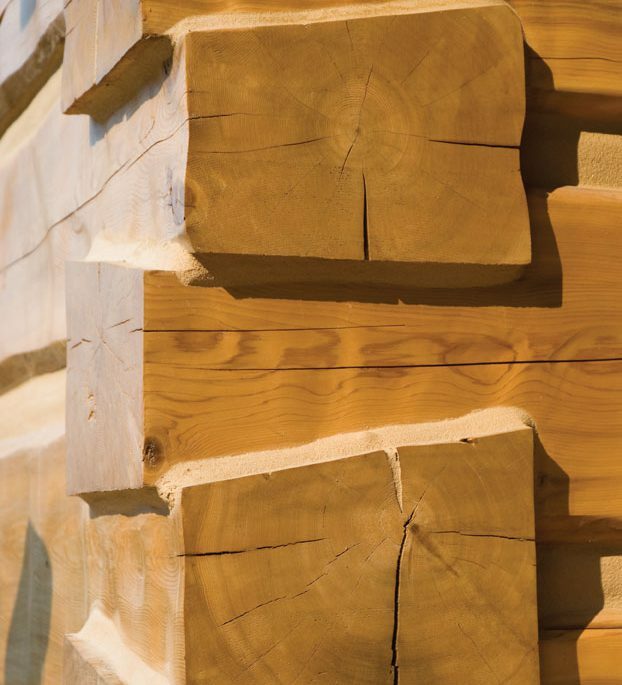 It is important to select a quality product with high elastic properties which will bend, expand, and mold to the natural movement of log timbers over time. Quality is the best policy here. How does the finish you choose play a role in maintenance? Though the selection of a high-quality finishing stain is a very important piece of the puzzle, it is not all that is needed. The absolute most important step in the finishing process is the proper preparation of the log and timbers for stain. Common processes include a thorough power washing and/or cob blasting. Once the surface of the logs and timbers is adequately prepped, the utilization of a high quality stain product will go a long way in providing the best possible protection for the logs and timbers. What type of finish should you choose? There are several good brands and manufacturers from which to choose. The most important thing is to get a good quality stain with a high UV blocking capability. It’s the UV radiation that will damage the wood over time. Any comments about choosing doors and windows? The same comment from the question about wood species applies here. Get the best quality door and window your money can buy. A beautiful, high quality window and door will last a long time. It’s expensive, not to mention extremely inconvenient, to replace doors and windows, so you’re better off getting a door and window that will last against time and the elements. Generally speaking, metal roofs are most durable and require the least amount of maintenance over time. However, they can be expensive for a good quality roof. Architectural composition asphalt shingles offer an excellent lower cost alternative. There are great looking options out there now and many come in 30 year or even 50 year warranties. What about elements of the overall design and style of the home? What specific things can you do to ensure that the home does not have maintenance problems down the road? Most maintenance issues in a home’s life relate to water issues. Generally speaking, use broad overhangs and porch roofs to keep moisture off of the exterior of the home. Use durable materials such as stone close to the ground to keep standing snow and ice off of logs, timbers, and siding. Make sure to treat your wood siding and log materials often per the manufacturer’s recommendations. Your logs will look their best over time if you stay diligent in treating your home. Finally, pay very close attention to your rooflines, especially where water runoff is going to flow and how snow might pile up on the roof. What about the land, topography, and surrounding trees? What type of choices should you make in this area to prevent any problems? Really, the same as any home. Clean out your gutters regularly and remove any moss on northern facing roofs. Also, pay very close attention to how water runoff is affected by your home. You might need to invest in French drains and dry wells to prevent any water damage during heavy rain storms. What are some things that you should avoid doing that might cause exterior maintenance issues down the road? Avoid using wood materials extremely close to the ground. Avoid letting proper and timely maintenance lapse.